And just like that, we turned two. Two years of building the most incredible group of supporters who understand there is important work to be done. Two years of sponsoring kids with big dreams and big hearts. Two years of surprises and celebrations and heartwarming stories of people helping people, and kids helping kids. Two wonderful years. Where do we go from here? We stay the course. Great growth comes from having both tenacity and patience. It comes from making sure our actions are aligned with a specific goal, but our focus isn't so intense that we miss a golden opportunity. It comes from believing in what we do and letting the smile on a child's face tell the story. We are excited about the year ahead. 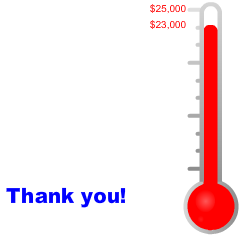 With donations in December totaling over $5,000, we are $2,000 away from our goal of raising $25,000 by March. We'll get there, no doubt about that, and we'll let you know when we do. Until then, please send in your requests for sponsorship, keep spreading the word about our mission, and know that we are so very grateful for your support.